← Building the ⟨Sci|State⟩ Studio—a weekend in time lapse. VARIABLE. A variable symbol is a symbol that is a placeholder for a number from a specified set of numbers. The set of numbers is called the domain of the variable. The beauty of the correct description of variable (and a point that needs to be made over and over to our students) is that it is the person who is using the variable who has ultimate control over what number they wish to insert into the placeholder. The power to choose the number they insert into the placeholder rests in the will of the student, not in the variable itself! The power to choose (and possibly start over and choose again) is what “vary” in “variable” means. Around the 1 minute mark, I say “are going to be numbers,” and Autumn follows up with a slightly strange sounding addendum remark, “or a number.” Autumn is actually clarifying my statement here: We don’t insert more than one number into a slot at a time. Instead, we insert only one number into a slot and that same number is inserted into every instance of the slot. The unit language that we have been using throughout this video series (and which runs all throughout Eureka Math) is present in the way we speak of arithmetic with variables as well. So, for example, “3 tens plus 2 tens is 5 tens” that students say in early grades is the same as “3 slots plus 2 slots is 5 slots” that Autumn says in this video. This makes the link between arithmetic and algebra much more obvious—in fact the two statements are exactly the same if we insert the number 10 into the slot! The algebraic expressions discussed in this video are: , , , , , , (and Autumn mentions ). Finally, we hope you enjoy laughing (with us) at the blooper that runs after the credits. We cut this segment from the main video because it was a rare “mental typo” that didn’t contribute to understanding the main point of the video. In general, in the “Growing up with Eureka” videos, we actually make a point of showing the real errors because Autumn and my discussions of those errors can lead to a better understanding of the concept for the viewer (cf. the discussion of “42 slots” in this video). 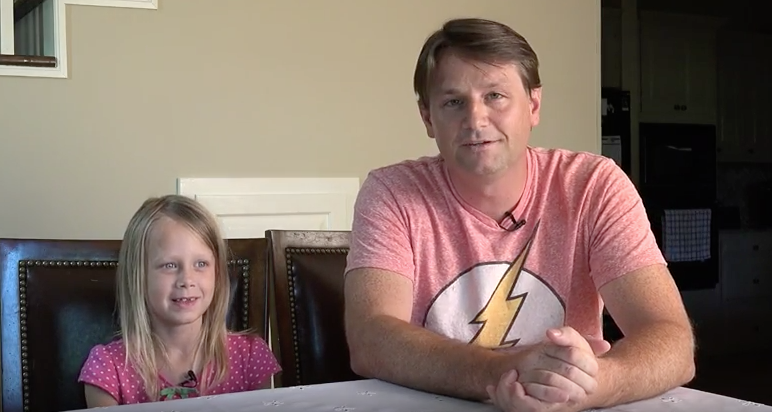 Video | This entry was posted in Growing Up With Eureka and tagged A Story of Functions, A Story of Ratios, Algebraic Expressions, Autumn Baldridge, EngageNY Curriculum, Equivalent expressions, Eureka Math Curriculum, Exponents, Expressions, Learning Mathematics, Learning to Multiply, Scott Baldridge, Variables. Bookmark the permalink. I’m convinced that the games kids play are based rudimentary organizations and processes (in math we call these “algorithms”). If we can constructively inject math/logic ideas and algorithms into play, or make play into learning directly about procedures (as in this case), we will be doing a massive favor to our kids: they will be able to understand more quickly, and create and imagine with more self-made structure.